The Washington Examiner – James Carafano: Are we ready for a cyber-Pearl Harbor? Is Bernanke Secretly Preparing A New Liquidity Blitz To Save The Faltering Recovery? Ben Bernanke needs fresh monetary blitz as US recovery falters. Senator Robert C. Byrd (D-WV) died early this morning at Inova Hospital in Fairfax, Va. 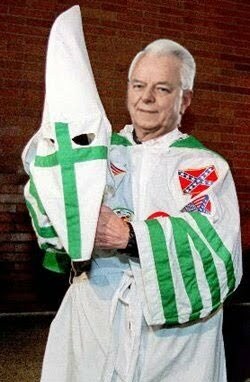 Upon arriving in Hell, he was immediately appointed KKK Grand Dragon. Byrd was greeted at the gates of Hell by long-time friend Ted Kennedy, who made an unsuccessful bid for president of Hell last year shortly after his own arrival. “Having … ah … Senata Byrd at my side again can only improve my … ah … chances of … ah … taking this place ova when elections come around again next yeya,” Kennedy said. Byrd, for his part, cried when he saw Kennedy again. “Ted, Ted, my dear friend, I love you, and I missed you,” he said. Satan, Kennedy’s rival for control of Hell, welcomed Byrd to his kingdom of filth. Is Jerry Nadler Still a Socialist? A little while ago, the House passed an amendment to the bill that we were considering, that says no contract or federal funds may ever go to ACORN, a named organization, or to any individual or organization affiliated with ACORN. Unfortunately, this was done in the spirit of the moment and nobody had the opportunity to point out that this is a flat violation of the Constitution, constituting a Bill of Attainder. The Constitution says that Congress shall never pass a Bill of Attainder. Bills of Attainder, no matter what their form, apply either to a named individual or to easily ascertainable members of a group, to inflict punishment. That’s exactly what this amendment does. Interestingly, the investigation was driven by Rep. John Conyers, the far left Democrat from Michigan – a man with close ties to the Marxist based Democratic Socialists of America. Strangely, ACORN is very closely tied to D.S.A. and has been for decades. So when the D.S.A. connected John Conyers, called for an investigation of D.S.A. connected ACORN, the effort was brought to a halt by the D.S.A. connected Jerry Nadler. What are the chances? Like President Obama, Jerry Nadler has long been close to Democratic Socialists of America – regularly attending the D.S.A. sponsored annual Socialist Scholars Conferences in New York. At the 1995 Socialist Scholars Conference, Nadler served on Panel 1 “Crisis In The City” with D.S.A. honorary chair Frances Fox Piven, co-originator of the notorious Cloward-Piven Strategy of deliberately overloading city and state welfare systems to the point of bankruptcy. The rival Social Democrats USA have alleged that Nadler is an actual member of Democratic Socialists of America. S.D-U.S.A’s website history of the U.S. socialist movement confirms the known D.S.A. membership of former Congressmen Ron Dellums and Major Owens, former New York mayor David Dinkins and former AFL-CIO president John Sweeney. The Social Democrats also name Nadler as a D.S.A. member. The Democratic Socialist Organizing Committee merged with the New American Movement, a socialist group that emerged from the New Left, to form the Democratic Socialists of America. To date, three members of the Democratic Socialists of America have served in the U.S. Congress: Ronald Dellums, Major Owens and Jerry Nadler. Democratic Socialists of America member, David Dinkins, was elected mayor of New York City. John Sweeney, a member of the Democratic Socialists of America, became president of the American Federation of Labor-Congress of Industrial Organization. Despite its deliberately innocuous name, D.S.A. is a Marxist organization closely allied to the Communist Party and other radical organizations. If one of Mr Nadler’s New York constituents would like to write to him asking the question: “Are you now, or have you ever been, a member of Democratic Socialists of America?” I would be happy to either publish his reply, or publicize the lack of. An excellent short doco on Boston’s radicalized Islamic Society of Boston Cultural Center. Symbolic of rampant appeasement of radical Islam in almost every Western country.